This is the 2nd guide showing how to dual boot Windows 10 and Ubuntu Linux. If you were using any version of Windows up to Windows 7 before upgrading to Windows 10 then it is likely this guide is for you. Before going on however follow these simple instructions to find out whether your computer is UEFI or BIOS based. Before doing any major work on your system you should take a backup as it can be time consuming and expensive to fix your operating system without a decent backup. I have written a guide (linked below) which shows you how to backup all of your partitions using a tool called Macrium Reflect. There is a free version of the tool available and the most this tutorial will cost you is time and if you don’t have one an external hard drive or a spindle of blank DVDs. Click here for a guide showing how to create a Ubuntu USB drive. How to install Win32 Disk Imager. How to format a USB drive. Booting into Ubuntu on a computer with a standard BIOS is a lot simpler than UEFI based machines. 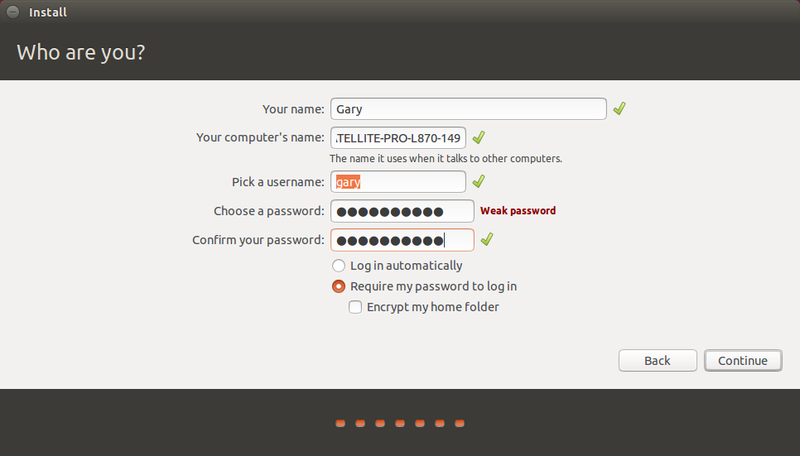 Choose the “Try Ubuntu” option. The main installation of Ubuntu is the same for BIOS and UEFI based machines. To start the installation click on the “Install Ubuntu” icon on the desktop. 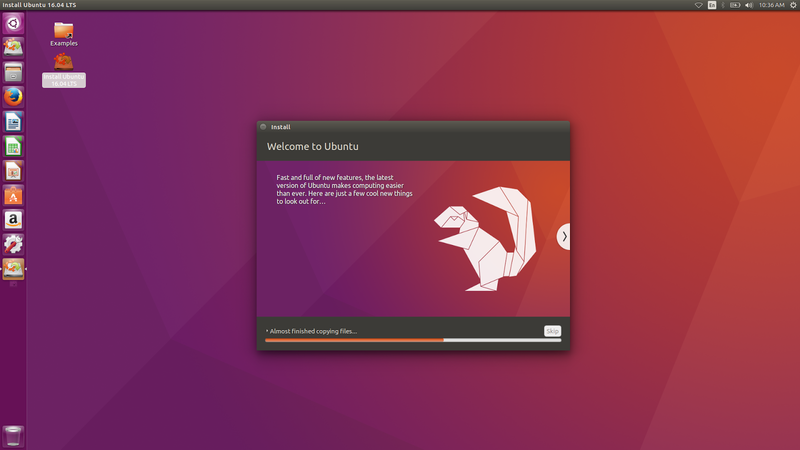 The preparing to install Ubuntu screen now simply lists the option to download updates (which is only available after you have an internet connection) and the option to install third party software for playing MP3 audio and watching Flash. If you have a decent internet connection then you might wish to install updates during the installation. If you do not see an option to install alongside Windows then you should click on the “Something Else” option. You may notice that it says the free space is unusable. If co click here for a guide to resolving this issue. When the process has finished you will have the options to continue test or to restart now. Click the “Restart Now” option. Try them both out and hopefully you will have successfully installed Ubuntu alongside Windows 10. Check out my new guide which shows how to show common applications such as Chrome, Dropbox and Steam easily in Ubuntu. After try this for several times, i've come across with your tutorial, and i can't get in the instalation type with the recognition of the windows 10 OS. Mine says "This computer dones't have any OS. What do you want to do?" I want to configure a dual boot instalation and I don't want to erase my windows 10 OS. Using Ubuntu (From CD or USB), try to open the partition where windows is located from "File Explorer". If you find an error saying that it can´t be mounted because windows is hibernating, try to solve this windows hibernating problem and then try to install again. For anyone finding this in the future, this is most likely as you have a BIOS version of Windows installed but your motherboard has UEFI mode enabled. Thanks! That helped me out a lot. Explains why Ubuntu doesn't find Windows 10 like in the screenshot above. I am not getting option to install alongside windows. I am trying to install it alongside windows10. I have shrinked my harddisk and made about 50 GB of unallocated space on my disk. Tried installing different versions of Ubuntu.. without any success. I myself prefer to use the Windows bootloader to chainload GRUB (which resides in my Linux partition's boot sector), instead of installing GRUB to the MBR in place of the Windows bootloader. Then, I used EasyBCD to add the linux distro entry and point it to the Linux partition where my GRUB resides. All in all, it keeps the Windows Bootloader intact in case a major Windows Update overwrites GRUB that one chose to install to the MBR. Does this also apply to different distributions built off of Ubuntu? Such as Mint? Tried several times, but windows 10 starts over with out any option to chose for Ubuntu. Could not configure ubuntu but lost two pendrives in this operation(now they read 2.1mb used of 2.1 mb). Will not recommend to blow up more flash drives. Your flash drives are fine, use this tutorial to restore them back to original state. Everything seemed to work fine, but now when I restart, I don't get the option to boot Ubuntu – goes straight to Windows 10. Please help! Did you follow the section about running efibootmgr within Ubuntu to make sure the boot loader was pointing at Ubuntu first? Hi Gary, there is no section about running efibootmgr in this blog post (that section was in your other UEFI Bios based blog not this one). I too have the same problem whereby after the install I do not get a option of which OS to choose on boot. My BIOS type is Legacy. Any ideas? Thanks. There is no efibootmgr for a standard BIOS because efibootmgr only deals with efi. My guess is that during the installation there is a bit where you have to choose where to put the bootloader. I think that this has been selected incorrectly. Can you open up disk management in Windows 10 and send me a screenshot at everydaylinuxuser@gmail.com? Hello/// I have the same issue as above, was their a resolution? Hey Gary – thanks for this great guide, easy steps to follow. Just wondering if you found out what the issue was? I am another user experiencing the same – BIOS type is legacy and now on restart I don't get the option to choose OS, just goes straight to Win10. To those having this problem, you probably have to change the boot order of your devices. When you first turn on your computer, it will give you the option to press either F2, F12, or some other function key to enter "Setup." From here, you can use your keyboard to change to boot order of your devices. Make sure that the USB Device (Or CD if you installed it on a CD) is the top option. 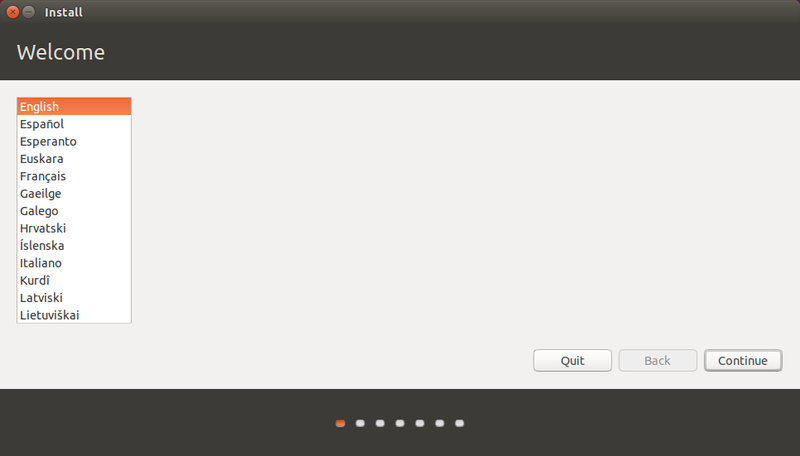 When you save and exit, the Ubuntu installer should start. 5. repeat steps 3 and 4 until the computer boots into grub. Dear, here is one problem, when we choose "Install Ubuntu alongside with windows 8.1" the system is restarted. help me. It is not giving me the "Install Ubuntu alongside Windows" option. It does say Windows 10 is installed however. When I go to the something else, the part that I shrank says it is unusable. Not sure what to do from here. I had the same issue. Very frustrating and was not able to resolve with my computer skill level. Ended up just overwriting the Windows installation (Have another system happily running Win10). 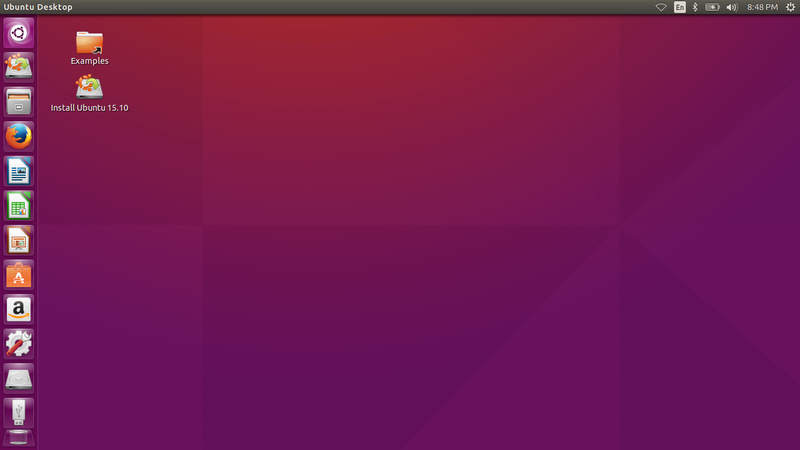 I prepared the usb with ubuntu, then I made space for Ubuntu in the SSD, but when I restarted to go install ubuntu, everything is black, there's no VGA signal, and after a while ubuntu starts loading something, but never goes to any menu. What should I do? Change the x64adm version? Or is something about the ssd? I'm really a noob. Hello – I wonder if you could help shed some light for me (or maybe even make a guide for my question!?!?). I want to set up my system to dual boot Windows 10 and Linux on two drives, but I want both OS to boot from the SSD I have and both OS to store files on the HDD. Suggestions on how to accomplish this? I cannot get it to work. I used to have Win 7 and Mint – KDE dual boot. I updated to Win 10 and kept dual boot. I am now trying to load a different version of Linux but I am not winning!! I eventually cleaned up to win 10 only on the full disk – no spare partitions etc.! A week later I decided to have another go and have followed your guide. The test says it is 'Legacy' – not UEFI. It refuses to load from the USB though it is second in the boot order after CD/DVD – have tried your shift key trick and cancelled fast boot too. Can and have loaded trial from DVD but the partition screen in install does not see Win 10 and insists on using the whole C drive!! Load along side is not an option. Tried the 'Something Else' option but cannot get that to work. Set EXT4 and Swap partitions but that does not work and when I look at the partitions they have become 'Do not use'. Do you please have any ideas?? I have never been able to boot along side windows 98 to 7 with linux. I have always created a separate partition, or used a 2nd hard drive and installed linux to that. but will require 3 hard drives and a hard drive swap bay. First hard drive say 1 tb (as storage) installed in pc, second HDD use in a swap bay and install windows 10, swap with another HDD and install linux. Doing it this way there shouldn't be any conflicts as you are only using 1 OS at a time. The biggest difference between UEFI and BIOS is that BIOS will likely need a CD burned with the .ISO because a bootable USB will NOT work… some guide,eh? I happen to have a laptop that uses BIOS (bought 4 years ago). It boots through USB. I also have a 13 year old desktop. Guess what. It boots through USB. Your argument is invalid. for your issues with ubuntu not picking up your windows partition follow this guide. http://www.tenforums.com/tutorials/4189-fast-startup-turn-off-windows-10-a.html It will disable fast-startup allowing the partition you created to be readable. By default windows will put the extra partition you created into a hibernation state saying that is "in use" and making it inaccessible. I'm getting the same problem as others where I've downloaded everything correctly but when I reboot it isn't prompting the Ubuntu screen to install or try it. Can you please help? kandipierre@gmail.com if you want to email. Follow the linked instructions for turning off fast boot and try again. I'm getting the same problem as others where I've downloaded everything correctly but when I reboot it is not showing the install or try it.It prompting the Ubuntu screen and stuck there…I also turn off the fast boot..bt nothings happened.. Thanks. Worked great on Dell E6410. Like some other users above this commend I have the problem where even turning off fast boot and doing everything else correctly my PC still boots on Windows 10 and is not letting me choose an operating system. My bios is legacy and I'm with laptop. If I could get any help it'll be great!!! 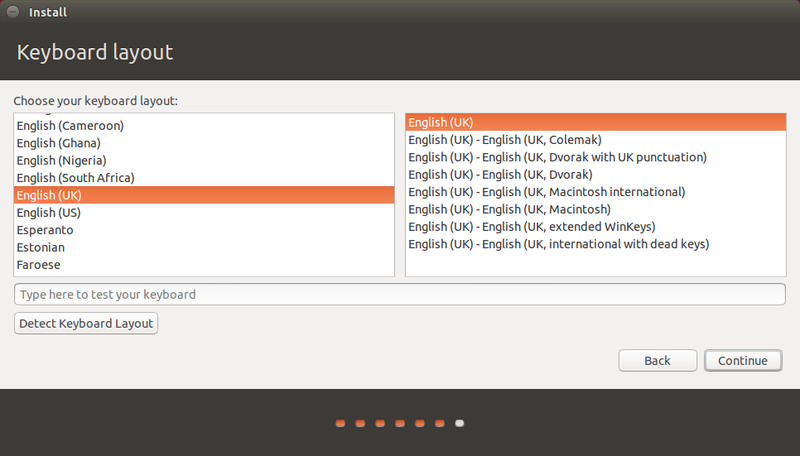 I have a problem to install Ubuntu like others. When I was at step to install Ubuntu alongside Windows 10, after I pressed continue , showed me one panel about how I want to separate my hard disc. After I did this, my PC never went to the next step(for the hour). And now when I try again, because previous doesn't have result, to install the Ubuntu at step <> doesn't show me the option install Ubuntu alongside Windows 10. ( sorry for my English) what can i do? This guide is really well done. Thanks! ubuntu wont give me the option of install along windows 10. Hi, thanks for your post. But I have a question: Will Ubuntu override my existing Boot Manager (Windows) and replace it with Ubuntu's Boot Manager (grub)? And if it does, how can I switch back to Windows to make Windows the default boot OS? It seems that Ubuntu is going to be installed on NTFS partition (From shrinking C drive guide). How could I make it installed alongside with my Windows but on Linux file system formats such as ext4? Your a tool you've never install a distro and windows 10 together…. This guide does not work . that was a period. If you are going to call somebody a tool you might want to understand the difference between your and you're. The screenshots kind of prove that I have installed Ubuntu alongside Windows 10. If your system BIOS Mode is Legacy then? c drive only has 39 GB (14 GB free) and d has 198 GB, what do I do? I can't shrink volume. Please help. The installation does detect that I have Windows 10 installed, but the only option I have is to overwrite it. When I try choosing "something else", the free space I have from shrinking the Windows 10 partition says unusable. Any ideas on what I could do at this point? Thanks for the great tutorial, by the way, I truly appreciate it and hopefully I'll be able to implement it soon. Might I add, I'm dual-booting Windows 10 and Windows 7. Thank you for the post. I cannot see the image 7/13 on my setup. It shows partitioning problem with my setup. I am a complete novice with this problem I tried reading on it on forums but could not understand much. Can anyone help me with this. – but "this computer currently has no detected operating system"
I'm a beginner. Following your instructions, I tried to install Ubuntu 16.4 alongside Windows 10 on my new notebook. Since I didn't have any USB stick at hand, I burned the ISO image to a DVD-ROM. I resized the Windows partition to half its former value, and turned fast run and hibernation off. Now, during installation, the freed space is still indicated as "unusable partition." 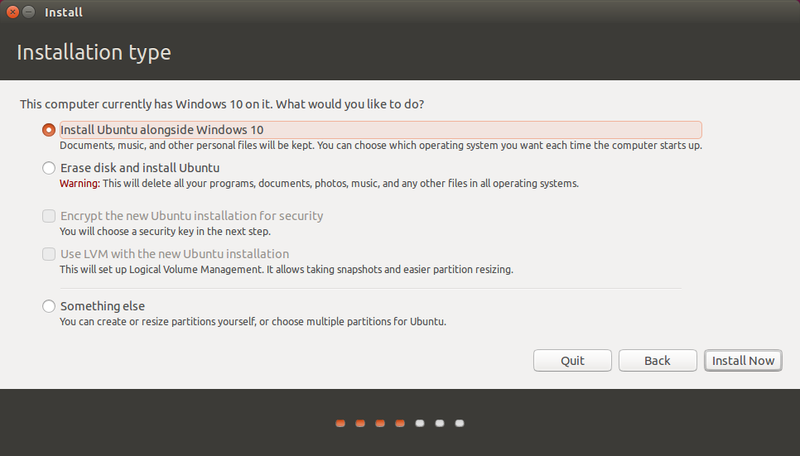 I don't see any partition ready to be used for the Ubuntu installation! On the other hand, there are already four partitions present that belong to Windows in one way or another. Maybe that's where the problem is? Please give me instructions. I have no idea what to do right now. 1. change to my Windows cd and install windows first, but do not need format again. 2. when windows all setted up. shutdown. 3. Put back ubuntu Cd and install as usual and on this time i can see my all partition including windows. 4. install my ubuntu 16.04 including boot loader (grub). Hi Gary, could you expand on what the "better option" is re: flash, mp3 and hardware please? HI Gary. Wondering whether you are alive? Thanks for the guide here, it got me through to Ubuntu just great. The problem that I am having is getting back over to windows 10. When my Lenovo v570 boots up it takes me straight to Unbuntu. If I just into the boot manager using F12 I can select Ubuntu or Windows boot manager, the problem is that windows boot manager takes me back into Ubuntu. Any suggestions? Can I boot windows from Grub? Thanks for you help both in the guide and with this issue! I've partitioned my hard drive, turned off fast boot, made sure UEFI mode is disabled, and mounted and accessed OS drive from within Ubuntu with no problems but I'm still not getting the Install alongside Windows 10 option when I try to install. I'm running a Dell Windows 10 PC upgraded from Windows 7. In Legacy "Standard" BIOS mode. I tried to use the "Something Else" option but after creating a swap partition out of the unallocated part the rest of the unallocated part changed to "Unusable". Because of Win32 Disk Imager My pendrive wasn't work. I have a Standard BIOS laptop and after following your instructions, get no boot menu and it boots straight to Windows. After reading all these posts I don't see an answer for my problem. Any ideas? BTW-Thanks for taking the time to create this. Was having the same problem. I had to change my BIOS settings to boot first from USB. After following this tutorial my system is stuck in an infinite boot, restarts at bios screen when the pc first boots, and repeats. 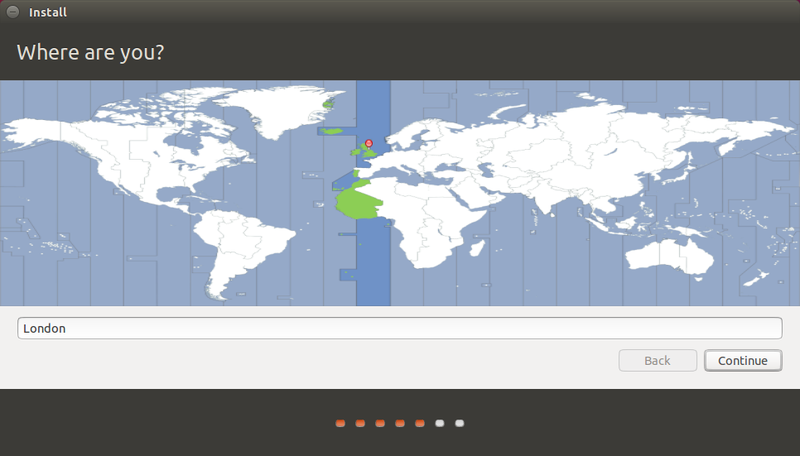 I folowed with the something else option during the ubuntu installation and successfully installed the system. The problem is that now i cannot figure out how to boot into my windows now. Can anyone help? Have shrunk C drive by 20000MB and it show up as 19.53GN Unallocated on that disk. Linux Mint 18 Sarah Cinnamon starts to install but when it comes to using the partition, the closest line item shown is 20971MB which is labeled "unusable" and I should be seeing a "free space" to install my LM18. Iam using Windows 10.Thanks for your great tutorial! If your newly shrunk space shows up as "unusuable" in Linux, one reason may be that you have hit the max limit of the number of primary partitions, which is 4. I used MiniTool Partition Wizard to convert one of my "primary" (you typically want to pick a non-boot, non-recovery, non-OEM primary drive; in my case this was D-drive) partitions to "logical". Like with any partitioning activity, you'd want to tread carefully and ensure you have a backup, as there is risk of data loss. Hello. If I install this alongside my Windows OS, will it make the computer/OS/whatever slower? I am a programmer and gamer and use a Gaming computer and dont want anything to be slowed. Hi. I followed this guide and installed ubuntu successfully "alongside Windows 10", having previously shrunk the disk space to make ~42GB unassigned. I now cannot access Windows 10, when I reboot it goes straight to GRUB with Ubuntu and Advanced Settings being the only options. Has it erased all my Windows and files? Help!? I am running Win10 over win7 (so BIOS Legacy)and want to dual boot with Ubuntu 16.4. I've done all as described in this great tutorial. When I try and boot from either USB or DVD I keep getting stuck! A pink screen quickly changes to a black screen saying NMI softbug lockup 22s etc and I can't get anything on Google that is helpful. What can I do sir? I installed windows 10 -64 bit at first ,,Then i tried to install Ubuntu 14.04 -32 bit ..But It shows all empty drive ie,. 1 Tb full space.. Why it happened? What is the main difference between the installation on UEFI and non UEFI?